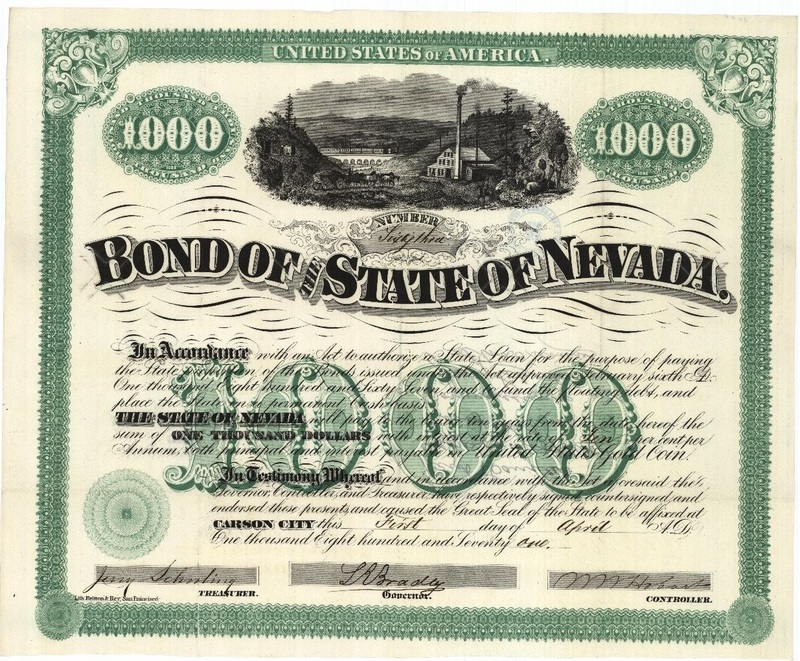 1871 bond issued to fund the State's floating debt held in the State Archives. State Archives control number 1000BondColor75dpi. This statement of core archival values articulates these central principles both to remind archivists why they engage in their professional responsibilities and to inform others of the basis for archivists’ contributions to society. Archivists are often subjected to competing claims and imperatives, and in certain situations particular values may pull in opposite directions. This statement intends to provide guidance by identifying the core values that guide archivists in making such decisions and choices. Core values provide part of the context in which to examine ethical concerns. Archivists promote and provide the widest possible accessibility of materials, consistent with any mandatory access restrictions, such as public statute, donor contract, business/institutional privacy, or personal privacy. Although access may be limited in some instances, archivists seek to promote open access and use when possible. Access to records is essential in personal, academic, business, and government settings, and use of records should be both welcomed and actively promoted. Even individuals who do not directly use archival materials benefit indirectly from research, public programs, and other forms of archival use, including the symbolic value of knowing that such records exist and can be accessed when needed. By documenting institutional functions, activities, and decision-making, archivists provide an important means of ensuring accountability. In a republic such accountability and transparency constitute an essential hallmark of democracy. Public leaders must be held accountable both to the judgment of history and future generations as well as to citizens in the ongoing governance of society. Access to the records of public officials and agencies provides a means of holding them accountable both to public citizens and to the judgment of future generations. In the private sector, accountability through archival documentation assists in protecting the rights and interests of consumers, shareholders, employees, and citizens. Archivists in collecting repositories may not in all cases share the same level of responsibility for accountability, but they, too, maintain evidence of the actions of individuals, groups, and organizations which may be required to provide accountability for contemporary and future interests. Archivists promote the use and understanding of the historical record. They serve as advocates for their own archival programs and institutional needs. They also advocate for the application of archival values in a variety of settings, including, to the extent consistent with their institutional responsibilities, the political arena. Archivists seek to contribute to the formation of public policy related to archival and record-keeping concerns and to ensure that their expertise is used in the public interest. Archivists collectively seek to document and preserve the record of the broadest possible range of individuals, socio-economic groups, governance, and corporate entities in society. Archivists embrace the importance of identifying, preserving, and working with communities to actively document those whose voices have been overlooked or marginalized. They seek to build connections to under-documented communities to support: acquisition and preservation of sources relating to these communities’ activities, encouragement of community members’ use of archival research sources, and/or formation of community-based archives. Archivists accept and encourage a diversity of viewpoints on social, political, and intellectual issues, as represented both in archival records and among members of the profession. They work actively to achieve a diversified and representative membership in the profession. Archivists recognize that primary sources enable people to examine the past and thereby gain insights into the human experience. Archival materials provide surrogates for human memory, both individually and collectively and, when properly maintained, they serve as evidence against which individual and social memory can be tested. Archivists preserve such primary sources to enable us to better comprehend the past, understand the present, and prepare for the future. Archivists preserve a wide variety of primary sources for the benefit of future generations. Preserving materials is a means to this end, not an end in itself. Within prescribed law and best-practice standards, archivists may determine that the original documents themselves must be preserved, while at other times copying the information they contain to alternate media may be sufficient. Archivists thus preserve materials for the benefit of the future more than for the concerns of the past. Archivists adhere to a common set of missions, values, and ethics. They accept an evolving theoretical base of knowledge, collaborate with colleagues in related professions, develop and follow professional standards, strive for excellence in their daily practice, and recognize the importance of professional education, including lifelong learning. They encourage professional development among their co-workers, foster the aspirations of those entering the archives profession, and actively share their knowledge and expertise. Archivists seek to expand opportunities to cooperate with other information professionals, with records creators, and with users and potential users of the archival record. Archivists ensure proper custody for the documents and records entrusted to them. As responsible stewards, archivists are committed to making reasonable and defensible choices for the holdings of their institutions. They strive to balance the sometimes competing interests of various stakeholders. Archivists are judicious stewards who manage records by following best practices in developing facilities service standards, collection development policies, user service benchmarks, and other performance metrics. They collaborate with external partners for the benefit of users and public needs. In certain situations, archivists recognize the need to deaccession materials so that resources can be strategically applied to the most essential or useful materials. Archivists make choices about which materials to select for preservation based on a wide range of criteria, including the needs of potential users. Understanding that because of the cost of long-term retention and the challenges of accessibility most of the documents and records created in modern society cannot be kept, archivists recognize the wisdom of seeking advice of other stakeholders in making such selections. They acknowledge and accept the responsibility of serving as active agents in shaping and interpreting the documentation of the past. Within the mandates and missions of their institutions, archivists provide effective and efficient connections to (and mediation for) primary sources so that users, whoever they may be, can discover and benefit from the archival record of society, its institutions, and individuals. Archivists serve numerous constituencies and stakeholders, which may include institutional administrators, creators and donors of documentary materials, rights holders, un/documented peoples, researchers using the archives for many distinct purposes, corporate and governmental interests, and/or citizens concerned with the information and evidence held in archival sources. Archivists seek to meet the needs of users as quickly, effectively, and efficiently as possible. Underlying all the professional activities of archivists is their responsibility to a variety of groups in society and to the public good. Most immediately, archivists serve the needs and interests of their employers and institutions. Yet the archival record is part of the cultural heritage of all members of society. Archivists with a clearly defined societal mission strive to meet these broader social responsibilities in their policies and procedures for selection, preservation, access, and use of the archival record. Archivists with a narrower mandate still contribute to individual and community memory for their specific constituencies, and in so doing improve the overall knowledge and appreciation of the past within society.